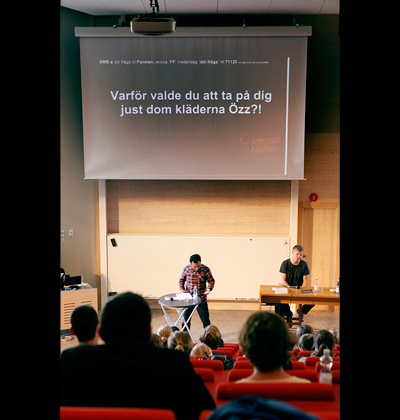 Özz Nujen moderating a panel debate at Researchers’ Night in Trollhättan 2011 with text messages on the screen. Using a text message service to send questions during a lecture gives the audience the opportunity to ask questions directly and to have an impact on the lecture. Displaying text messages on a screen (after they have been reviewed and approved) allows the participants to express their opinions, ask questions and comment, which makes the lecture more interesting for the audience who feel they more involved. Text message services can be purchased from numerous suppliers. Preparations: Find a lecturer, text message service and venue. Inform people about the activity. Prepare suitable questions in consultation with the lecturer to launch a dialogue. Market the activity. Challenges: Finding a text messaging service for a reasonable price. Benefits: A text message service increases interaction and can attract more participants. Popular science lectures for the general public are common. For them to work, the level and content must be tailored to the target audience. Moreover, the questions and answers should be designed to support two-way communication. Choice of venue and time are other important parameters, as well as advertising the lecture well in advance. What factors determine our choice of partner? Why does wealth generally not lead to happiness? Can nanoparticles in skin creams and paint be dangerous?